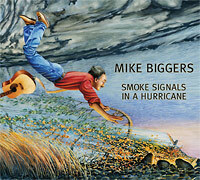 Welcome the release of Mike Biggers’ first solo CD, Smoke Signals In A Hurricane. A 13 song CD, Smoke Signals In A Hurricane contains a mixture of the various styles of music that have influenced Mike over the years. From the heart-tugging parent’s perspective of a child leaving home in “Preparing Me,” the comical, clever use of motel chain names in “Motel Love Affair,” the unending pull of addiction in “Color of Rain,” to the kick-back, no-worries, happy-as-I-am tune “It Doesn’t Matter Which Way the Wind Blows,” Mike captures numerous emotions in the thirteen songs on this CD.